Yang Huang, an award winning Chinese writer, has penned a handful of short stories about a family in China in her new book called, My Old Faithful. The stories explore the lives of each family member and their secrets, desires, dreams and passion beyond the facade of a society stirred up due to China's one-child policy. Each family member opens up their heart about certain events of their lives that either affect the lives of their close ones mostly in an emotional way. The every day life and the struggles attached to it for a very simply family of five consisting of a mother, father, and three children, against the backdrop of China and America. Evoking both the drama of familial intimacy and the ups and downs of the everyday, My Old Faithful introduces readers to a close-knit Chinese family. These ten interconnected short stories, which take place in China and the United States over a thirty-year period, merge to paint a nuanced portrait of family life, full of pain, surprises, and subtle acts of courage. Richly textured narratives from the mother, the father, the son, and the daughters play out against the backdrop of China's social and economic change. 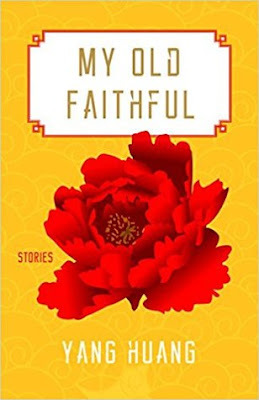 With quiet humor and sharp insight into the ordinary, Yang Huang writes of a father who spanks his son out of love, a brother who betrays his sister, and a young woman who dares bring a brown man home to her conservative parents. She writes of an aging wife and the kindness she shows a young prostitute caught soliciting her husband; of a woman returning to China after many years to find her country changed in ways both expected and startling. This collection, by a writer who grew up in Jiangsu province and participated in the 1989 student uprisings, is remarkable in its sense of place and fidelity to lived human experience. Set against the backdrop of China and spanned over 30 years, the stories about Chen family, comprising of a husband and his wife and their three children, one son and two daughters, reflect a multitude of family dynamics through their struggles, secrets, desires, ambitions, grief and happiness that affect one another. There are 10 stories, the first story opens with the son, when he was a boy, and what happens when he loses his dog and how much it affects him and that finally leads him to become a thief. Next one, is about the father and his disappointment with his son and how much of a rebel he is becoming as he is growing up. The father is trying to comprehend with his unruly son's psychology, even though in the first story, the author projected the son as someone exceptionally thoughtful and sensible. Likewise, in the stories followed after, the author narrates some landmark events and memories of the rest of the characters, like the daughters, Rou and Lian and the nameless mother, who we will see her celebrating her birthday in one story and celebrating her 30th anniversary in the last story, but will always come across as someone extremely selfless and loving. The characters are all very well developed by the author with a hint of realism and by keeping intact their flaws. Yes, they will come across as someone the readers know from their daily life. All of the characters exhibit enough honesty when they narrate their own memories and lives that eventually affect the rest of the family members either in a positive or a negative way. Like the son, Wei, exploits his sister sexually one time and how both of them intercepts the event in their own way is really clever and sensible. All the characters are laced with their fatal flaws, yet their down-to-earth demeanor will leave a lasting impression in the hearts of the readers long after the story has ended. The author's writing style is extremely brilliant, laced with subtle hints of evocativeness and is also wrapped tightly with unpredictable turn of events that will eventually leave the readers engaged and curious to their very core. The narrative is authentic, free-flowing, often funny and is easy to comprehend with. The pacing is smooth and moderate as the story peels away so many layers of the characters not only through the character's own eyes but also from the perspective of the other characters. The backdrop of China is vividly painted by the author, as the author has mentioned about the contemporary life style of a middle class Chinese family and their aspirations, the Chinese culture, the superstitions, the clothes, food, education and everything simply brings alive China in an exotic and never-before-seen way. In a nutshell, this poignant story about a middle class Chinese family is a must read for all the contemporary fiction readers. Verdict: A deeply moving portrait of a family against the backdrop of a contemporary China. Courtesy: Thanks to the author herself for giving me an opportunity to read and review this book. Yang Huang grew up in Jiangsu, China and came to the U.S. to study computer science. While working as an engineer, she studied literature and pursued writing, her passion since childhood. Her collection of linked family stories My Old Faithful won the Juniper Prize for Fiction. Her debut novel Living Treasures won the Nautilus Book Award silver medal in fiction. Yang attended Boston College and earned an MFA from the University of Arizona. Her essays, stories, and screenplay have appeared in Poets & Writers, Literary Hub, The Margins, Eleven Eleven, Asian Pacific American Journal, The Evansville Review, Futures, Porcupine Literary Arts Magazine, Nuvein, and Stories for Film. Yang lives in the San Francisco Bay Area and works for the University of California at Berkeley. Besides her day job and family life, she writes fiction and aspires to make the world a better place.